The JOSHUA Prison Reform Task Force has had a powerful year! We have risen to the challenge of employment barriers for those who have a criminal record. This took shape in the Ban the Box Campaign. Many employment applications include a box asking one to indicate a prior felony, ordinance violation or misdemeanor. When the Box is checked, these applications are often dismissed without a chance at an interview. We know that employment is one of the best ways to decrease recidivism and makes more possible for people leaving prison or jail to come home find work. Though a prison or jail sentence is served or a fine paid checking the Box amounts to another sentence limiting one’s opportunity for employment and restoration to community. Banning this Box diminishes the potential for employers to discriminate on the basis of prior convictions. However, Ban the Box will not prevent background checks typically done for all candidates later in the hiring process. Banning the Box will not change laws that specify certain convictions cannot work in particular occupations, nor will this force employers to hire people not qualified for a position. Our faith calls us to Godly justice that restores individuals and communities. Our faith calls us to see the God given worthy, dignity, talents and abilities in all people regardless of a criminal record. Close to a fourth of Brown County residents have a conviction record so this is vital for the health and wholeness of our community. This is about members of our faith communities, friends, families, neighbors who are finding barriers to employment. We Rose to the Challenge! On October 18th, 2017 the Brown County Board passed an ordinance to Ban the Box in Brown County! This action reflected well over a year of advocacy work by the Prison Reform Task Force in talking with elected officials, involving people impacted and concerned community members, attending and speaking at County Board meetings, writing letters, and being part of media events. In this process we found an amazing ally in Supervisor Mark Becker who took on this challenge in putting forward an ordinance to Ban the Box permanently in Brown County. We are grateful for the conversations with so many of our County Board Supervisors who took time to research this issue considering the impact on our community. In the Spring of 2017 we brought back to Brown County the replica solitary confinement cell. The cell was hosted by First Presbyterian Church in De Pere. Through the week we hosted an open house, welcomed guest speakers, heard personal testimonials and shared in a prayer vigil. The week’s activities again highlighted the realities of people subjected to torture. Our faith led us to again rise to the challenge of addressing the dehumanizing nature of solitary confinement practices in Wisconsin. We shined a light on torture that often lasts weeks, months, years and decades. Again calling for practices that work to rehabilitate, renew and restore people to community. As we look to 2018 we seek to be faithful to God’s call to true justice that restores and heals individuals, families and communities. We are grateful for JOSHUA’s long history of work on reform of our corrections system. Early on JOSHUA’s work helped form Brown County’s first Treatment Alternative Court, the Drug Court. Since then an additional Mental Health, Veterans and Heroin Court have been launched in Brown County. As concerns about prison and jail overcrowding are expressed we may seek to build upon the work of our early days in advocating for expanded treatment alternatives to prison and jail. We remain up for the challenge… will you join us? Are you up for the challenge? Join us the fourth Thursday of the month at 5:30pm at West Side Moravian Church. 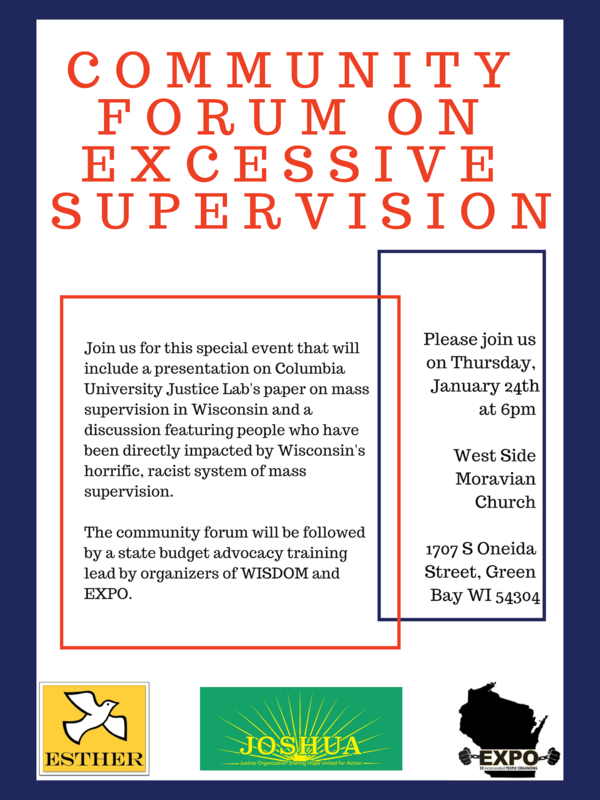 Join us for this special event that will include a presentation on Columbia University Justice Lab's paper on mass supervision in Wisconsin and a discussion featuring people who have been directly impacted by Wisconsin's horrific, racist system of mass supervision. The community forum will be followed by a state budget advocacy training lead by organizers of WISDOM and EXPO. Interns are responsible for finding a faculty sponsor and meeting all internship requirements of the college or university. 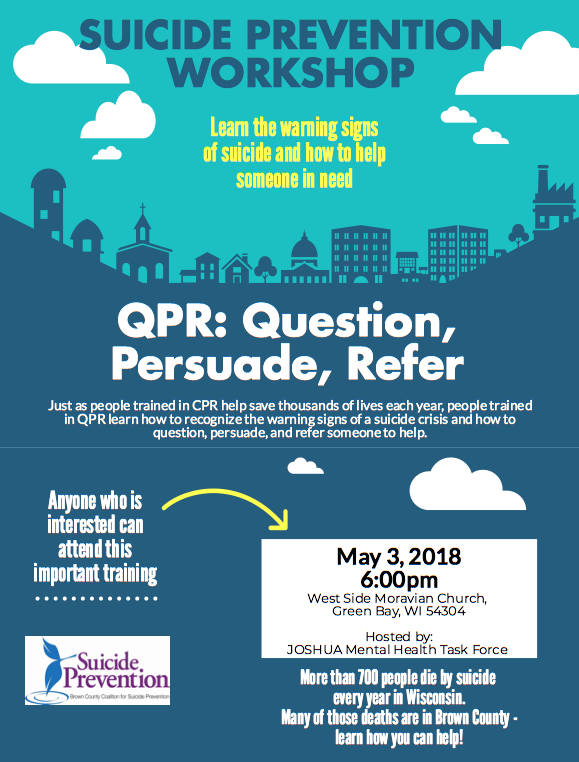 To Apply Please send a letter of interest and resume to Rachel Westenberg at rachel.wisdomwi@gmail.com Call 920-360-3538 with any questions. Deadline Positions are Limited. Early Applications will be given preference. We have started 2018 off with lots of action. 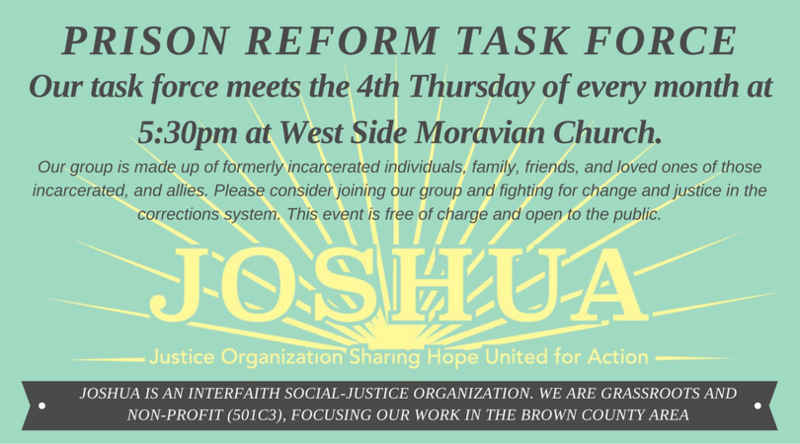 From public forums, to board retreats, and actively working on issues of mental health, prison reform, and environmental justice we continue to build JOSHUA to be a powerful organization of change in Brown County Wisconsin. With all action there is always a cost. That is why from March 1st 2018- April 30th 2018 we are having a Sustaining Member Campaign. JOSHUA’s strength comes from our numbers and from our solidarity. Just imagine: if JOSHUA had 150 members giving an average of $20 each month, JOSHUA would have an additional $36,000 every year to dedicate to the fight of doin’ justice. We are well aware that some of you already contribute monthly and your support is greatly appreciated. When you originally decided to become a monthly sustainer, we are sure it was based upon your financial position at that time. As you continue to assess your charitable contributions you may be interested in expanding your commitment to JOSHUA. In the past some members had difficulty remembering when their annual membership contribution was due. With a monthly contribution you are always up to date. Please consider becoming a sustaining member of JOSHUA as we continue to fight for justice in Brown County WI.